Victoria Mews is an Eldercare Assisted Living facility that has acquired Advanced Standing in the industry. 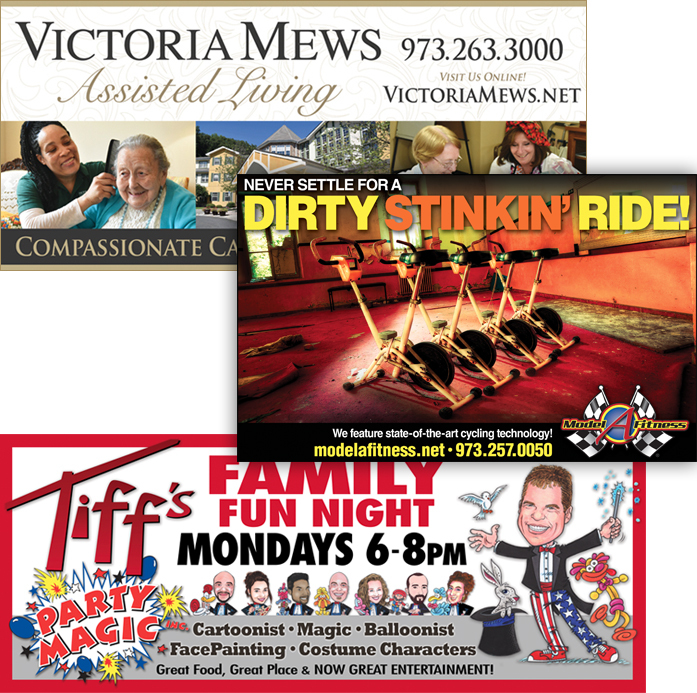 Projects include creating newspaper ads, signage. logo design, and bi-yearly large outdoor Billboard Banners. These large banners, located throughout Northern New Jersey, are eye-catching and simple to read as you drive in your car. Model A Fitness is a gym and fitness club that offers many of the same amenities as the larger chains, but at a fraction of the monthly cost. The gym prides itself on maintaining a cleaner more well-kept gym environment compared to the big box gyms. The shocking image and comparison text headline, hits the target and makes the point clear. Party Magic provides entertainment for kids parties and businesses around New Jersey. They create and provide balloon animals, face-painting, costume characters and other specialties to make your event a success. Using hand-drawn characters as the main elements, the poster relates well to the services that Party Magic provides. If you happen to come across a banner, go check them out they are a bunch of fun! For More Samples: Click Here!